Somehow or other gay people have also taken a glancing hit in the Oklahoma! thread, and although I’ve been surprised so far not to see that old bugaboo “political correctness” pop up for a bashing, I imagine one of the trollsters will correct the oversight soon. I’ve known Marty for many years, and although he is a gentleman of easy humor, agile mind, literary grace and elegant personal style, he does not suffer fools gladly. He also has a Quixotic streak: Every now and again, when the windmill starts jabbing, he feels compelled to jab back. Not that the windmill’s noticed, but Marty’s sliced it into tiny splinters, sprinkled it with balsamic vinegar, and eaten it for lunch. 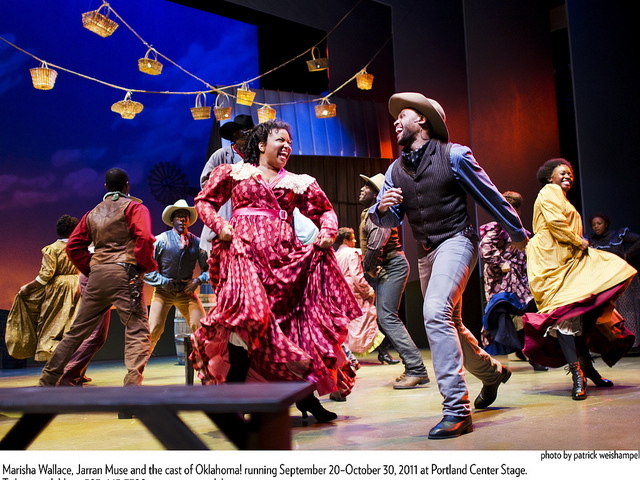 As it happens, I went to Friday night’s opening performance of Oklahoma!, and Coleman’s concept of the play works quite well. It’s true that a lot of the Old West’s cowboys were African American (though you wouldn’t know that from the glory days of the Hollywood western), and it’s true that Oklahoma in its pioneer days had 60 towns that were all or nearly all black in their makeup. In at least one important sense that doesn’t matter to Oklahoma! the musical, because Oscar Hammerstein II’s book is just as much about the dark and stultifying side of American small town life as it is about the peculiar genius of American optimism, and neither of those is a topic that white folks own exclusively. But if you want to get historical about the thing, which at some level isn’t a bad idea even though the musical is a piece of fiction, the idea of presenting Oklahoma! as a story that plays out in a black community accurately represents an interesting aspect of frontier life in the Oklahoma territory leading up to statehood. So where’s the problem? Who belongs and who doesn’t? As a nation we face that question perpetually, and often, it seems to me, reply to it in the stupidest possible ways. Art, literature, theater allow us to try on different ideas about this perplexing question, to take them for a test drive and see how they feel. In Oklahoma! and the likes of Carousel and South Pacific, Rodgers & Hammerstein loved the process: for all of their exuberance, they were also taking the idea of democracy for a four-wheel spin over some pretty rugged terrain. So. A story about love and ostracizing in a small frontier town? Sounds pretty all-American to me. 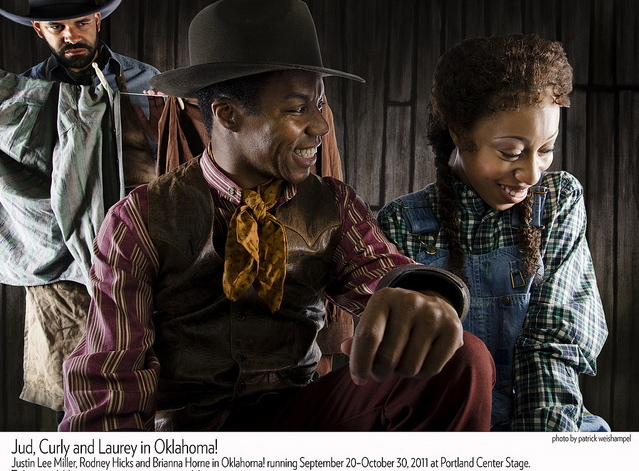 One of the interesting things to me about watching Center Stage’s Oklahoma! was that, while on one level I was aware from beginning to end that the actors were black, on another level I didn’t really notice at all. I was simply swept up in the story, or, where I had reservations, my reservations were on technical grounds: Was this voice right? Did these two have the chemistry the roles call for? Was the dance scene cut back too much (or not enough)? These aren’t questions that Fox News need take up. Still, I liked very much that Coleman’s production has linked into an underpublicized historical truth, the presence of full-fledged, independent African American communities on the frontier. I like the way it suggests that, on some basic level, communities simply act like communities. And I like the way that idea dovetails with an aspect of the play that I’ve long considered crucial to Oklahoma!‘s success: the role of the outsider in American life. In Rodgers & Hammerstein’s play, that role is taken up by Jud Fry, the hired hand on Laurey’s farm who carries a torch for her and hopes to marry her — a foolhardy quest, as it turns out, since he comes from a lower caste and his competition is Curly, the golden boy with a mean streak no one else can see. Poor Jud doesn’t stand a chance. (He’s played here by Justin Lee Miller, who sings the role with a shivering fierceness.) Jud’s the stiff who drew Shirley Jackson’s lottery straw. Something Shakespearean touches his surly outsidership and the way he’s shunned by the “good” community. Jud has bits of Shylock to him, and bits of Caliban, and bits of Malvolio. Like all three of those star-crossed gentlemen he can be a mean son of a gun, but he comes by his anger honestly: He’s done his duty, he’s played by the rules as he understands them, and he’s been mocked and shunned. As long as we’re playing the historical game, it’s interesting to think about Oklahoma the territory as it intersects with Oklahoma! the entertainment. Oklahoma became a state relatively late in the game, in 1907, and the musical takes place sometime on the cusp of that great event, as the inhabitants of the territory are eagerly anticipating their full-fledged entry into the union. Yet in a deeper sense, the sense of racial and cultural dividing and conquering, the territory had been prototypically American for a long time. In the 1830s it was the dumping ground for the Southeastern Indian nations that the white landowners no longer wanted around, the end-point of the infamous Trail of Tears, the forced and fiercely brutal series of marches by the Cherokee, Choctaw, Muskogee, Seminole and others following the Indian Removal Act of 1830. Oklahoma, or at least large chunks of the current state, became known as the Indian Territory, a place the nation’s power brokers decided the Indians could have because it wasn’t worth much of anything, anyway. The late 1880s and the ’90s were the time of the Oklahoma land rushes, when homesteaders were allowed to rush into the territory and claim their 160 acres to begin a new life. (Oklahoma is called the Sooner State because of the “sooners,” those plucky pioneers who jumped the gun and rushed into the territory early, staking their claims before the official starting date.) Nominally the homesteading claims were in parts of the territory uninhabited by Indians, but that extremely loose definition had much more to do with railroad ambitions than the facts of the matter as they were actually being lived. None of this is explicit in Oklahoma! the musical, but all of it is implicit in the play’s historical setting. Sure, it’s a beautiful mornin’. Let’s just not talk about last night. Yet when discussing a classic work of art it’s incumbent to think about it in the context of its own time as well as our own, and that’s why Jud, to me at least, seems so central to the play: He’s the presence of what’s been lost or conquered as the bright new culture surges optimistically forward. He’s the reminder: There is blood in the ground. So, my modest proposal for the next production of Oklahoma!, wherever it might be: Why not cast Jud as a Cherokee or Choctaw? It would explain a lot about the community’s reaction to him (all of that fear and loathing can’t be just because he has girlie pictures hanging in his hovel). It would open a terrific role for a Native American actor. It would cast a spotlight on some uncomfortable historical truths that the nation would just as soon forget. And it would give the Web trolls something fresh to howl about.